- J.D. Meier, Alex Homer, David Hill, Jason Taylor, Prashant Bansode, Lonnie Wall, Rob Boucher Jr, Akshay Bogawat. The purpose of the Application Architecture Guide is to improve your effectiveness building applications on the Microsoft platform. The primary audience is solution architects and developer leads. The guide provides design-level guidance for the architecture and design of applications. It focuses on the most common types of applications, partitioning application functionality into layers, components, and services, and walks through their key design characteristics. 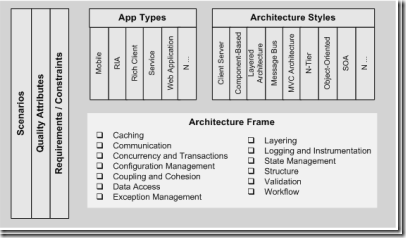 Architecture Frame - is a map of some of the most important elements of architecture, including scenarios, quality attributes, application types, architecture styles and key engineering hot spots. Application Types - a set of canonical application archetypes to illustrate common application types. Each archetype will be described in terms of the target scenarios, technologies, patterns and infrastructure it contains. Each archetype will be mapped to the canonical app frame. They are illustrative of common app types and not comprehensive or definitive. Application Feature Frame - a common set of hot spots for key engineering decisions. Quality Attributes - a set of qualities/abilities that shape your application architecture: performance, security, scalability, manageability, deployment, communication, etc. Layered Application Reference Example - describes at a meta-level, the tiers and layers that an architect should consider. Each tier/layer will be described in terms of its focus, function, capabilities, common design patterns and technologies. Principles, patterns and practices - using the frames as backdrops, the guide overlays relevant principles, patterns, and practices. This page was last modified 02:44, 22 January 2010. This page has been accessed 34,079 times.